Technically, the crypto market is still trying to finally stop correcting and start making new highs. This upward move may be the last one before another midterm downtrend. Over the last week, few things changed for BTC in the long term. The flagship crypto is still correcting after testing its local highs. 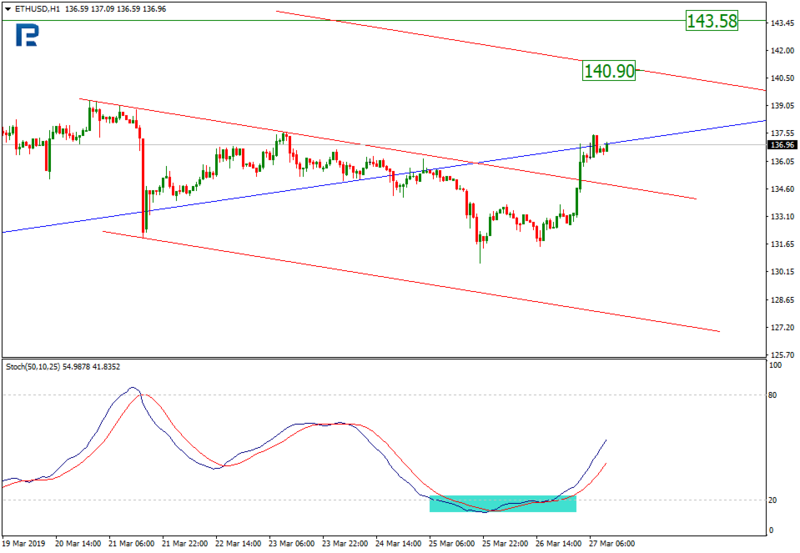 On H4, the price is inside a descending channel. With the previous ascending channel support broken out and the MACD headed down, a fall to the projection support at $3,777 is possible, and then the major support at $3,585 may be reached. Conversely, if BTC manages to break out round number at $4,000, it may then hit the midterm resistance at $4,150. 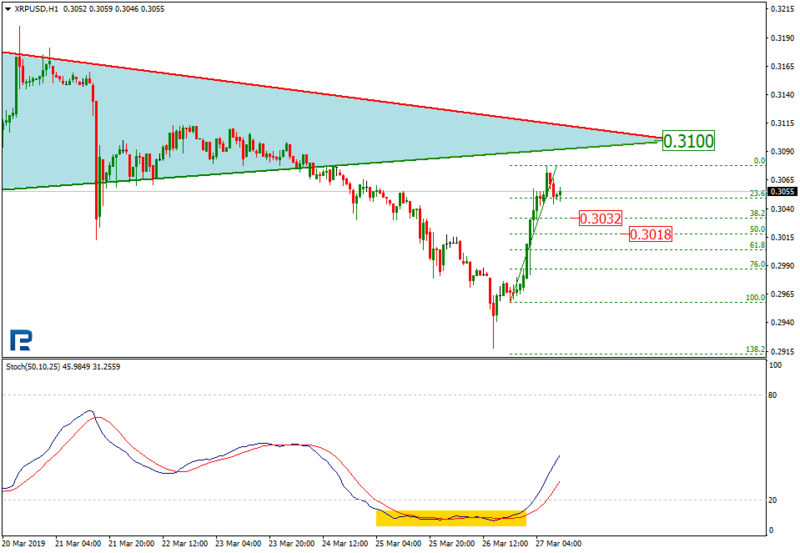 On H1, the Stochastic formed a golden cross and left the oversold territory, which led to a short term upmove. The next target lies at $4,000, and then at $4,045. The short term support is meanwhile at $3,925. On H4, EOS is leaving the consolidation channel and rising, aiming at the long term resistance at $4.42. This is confirmed with the MACD forming a golden cross. The major support is meanwhile at $3.70. On H1, EOS stopped rising, while the Stochastic entering the overbought territory may signal a pullback that could send the price to 23.6% ($4.03), 38.20% ($3.96), and 50% ($3.89) Fibo, respectively. Once the resistance at $4.16 gets broken out, the uptrend may continue. On H4, Eth is still correcting in the short term, while in the midterm, the uptrend is here to stay. The short term ascending channel got stopped with a support breakout, which could send the crypto to the major support at $119.65. The local downtrend did not change the overall outlook, though, as the fractal support levels didn’t get broken out. The MACD is meanwhile signaling the downtrend momentum has not faded out. 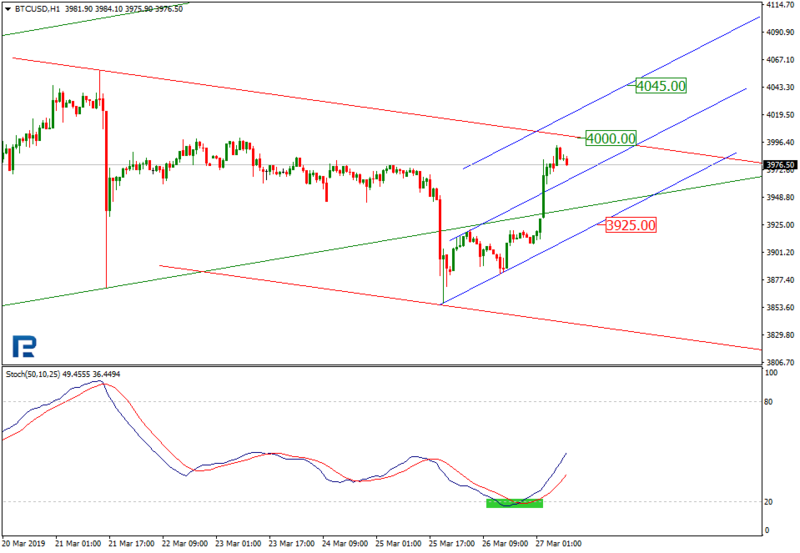 However, in case the local high at $143.58 is broken out, the previous channel resistance at $155.20 may be achieved. On H1, Ethereum is testing the support that already got broken out bottom up. The short term channel was meanwhile stopped with an upward movement aimed at the projection resistance, or $140.90. This is confirmed by the Stochastic having formed a golden cross and left the oversold territory. 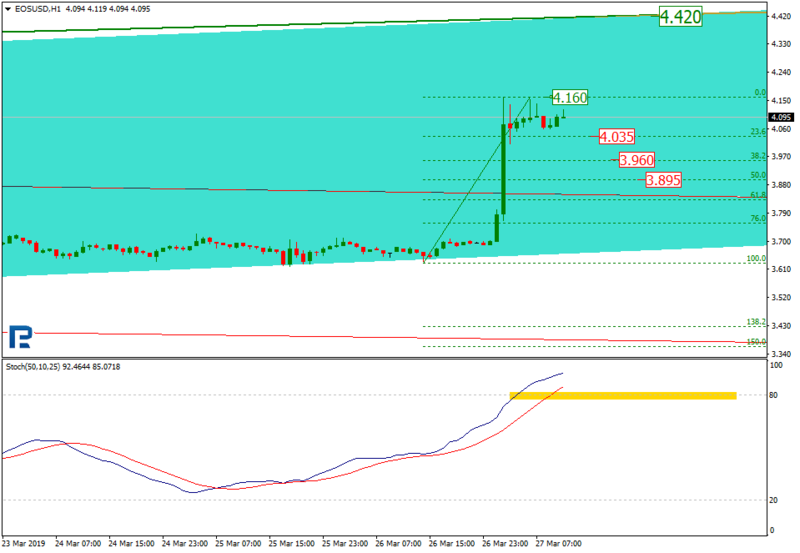 LTC is correcting and consolidating on H4, having only reached 23.60% Fibo. 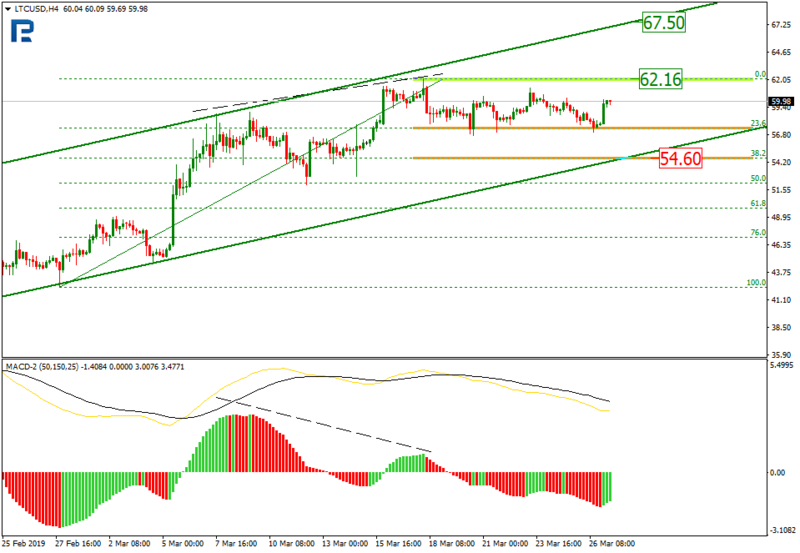 The crypto can also reach 38.20%, or $54.60, though, which may lead to the current ascending channel support test. If the price then bounces and hits the resistance at $62.16, LTC may reach another resistance at $67.50. 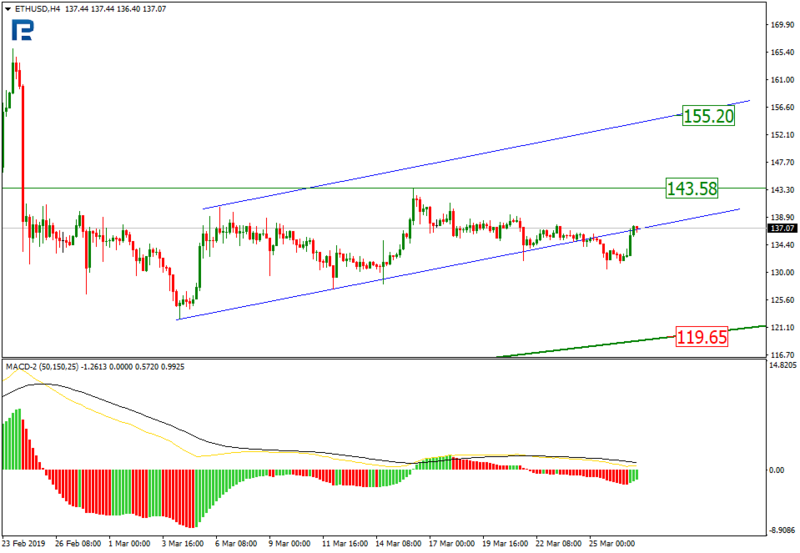 On H1, the current trend is being reversed after the resistance has got broken out. 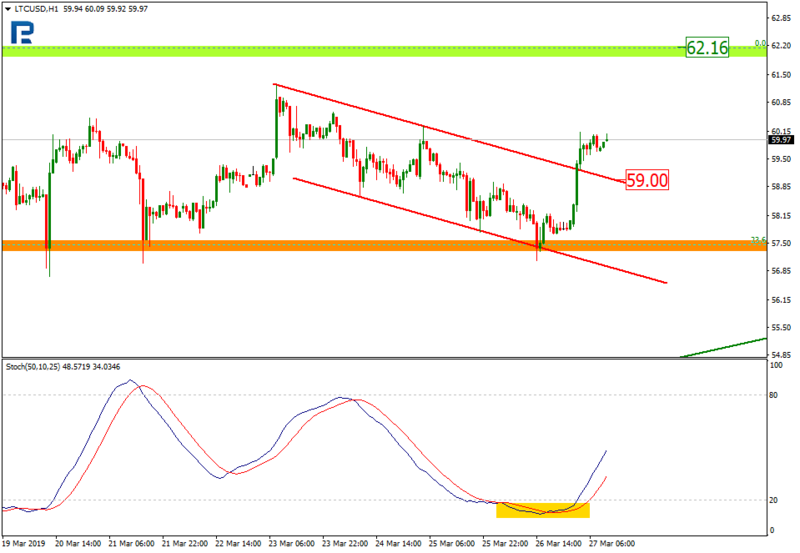 The Stochastic formed a golden cross and left the oversold territory, which may send the price to the high at $62.16. The support is meanwhile at $59.00. On H4, the price left the triangle by breaking out the support. XRP also tested the fractal support area, and is now trying to stay below, pulling back to the resistance at $0.3100. 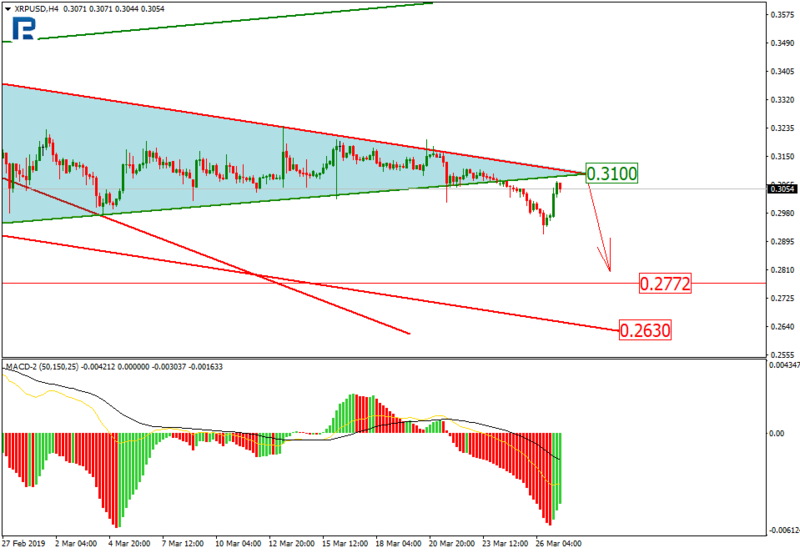 This may be followed with a downmove to the major low at $0.2772, and then to $0.2630. The MACD is negative, which confirms the possible downtrend. 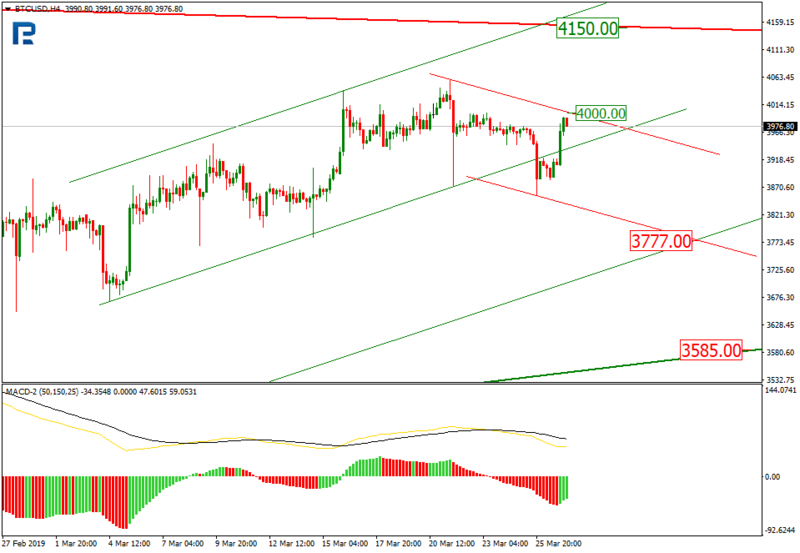 The H1 chart shows a correction trend that follows the downmove. In the short term, the price may get stopped and head down to 38.20% ($0.3032) and 50% ($0.3018). The Stochastic meanwhile left the oversold territory, which may signal a rise.